The dragon fruit plant (Hylocereus undatus), also known as the pitaya, strawberry pear or night-blooming cereus, is a tropical fruiting vine native to southern Mexico and South America. The dragon fruit plant is a fast-growing, perennial, vine-like cactus with stems that can reach 20 feet long. This plant produces large white, fragrant, bell-shaped flowers that bloom at night and can grow as large as 14 inches long and 9 inches across. The fruits are oblong, 4 ½-inch-wide berries with red or yellow peels and many small black seeds in the pulp. The dragon fruit plant can grow only in tropical climates that don’t experience frosts or freezing temperatures. Water your dragon fruit plant deeply and thoroughly once every other day during the summer, and then water the plant once or twice each week during the fall and winter in the absence of rainfall. 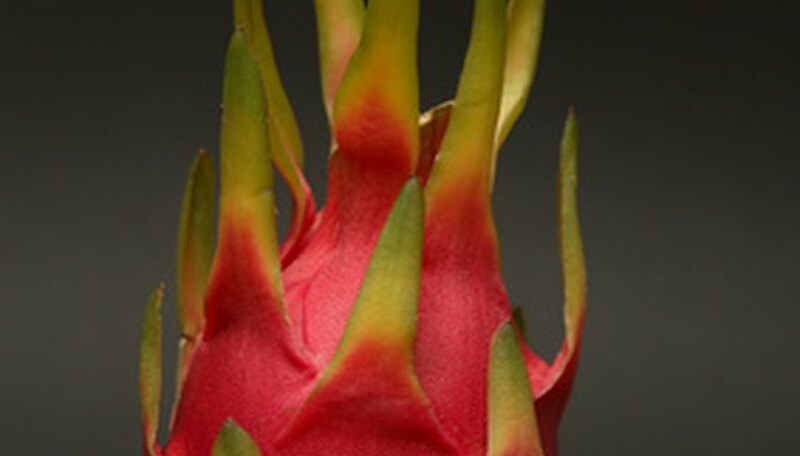 Don’t water the dragon fruit plant during spring to provide a dry period that will induce flowering. Feed your dragon fruit plant during the first year after planting it once every two months with ¼ lb. of 6-6-6 NPK palm tree fertilizer containing 2 to 3 percent magnesium. Spread 4 lbs. of well-rotted manure or organic compost on the ground around the base of the dragon fruit plant, keeping it about 1 inch away from the stem. Apply up to six foliar sprays of minor elements from late March through September. Spread a 2- to 6-inch layer of bark or wood chip mulch on the ground around the base of your dragon fruit plant. Keep the mulch 8 to 12 inches away from the plant stem. Erect a sturdy climbing support, such as a strong trellis, beside the dragon fruit plant. Train the dragon fruit plant on the trellis by pruning away the lateral stems that grow on the main upright stem until the plant reaches the trellis. Tie the main stem to the trellis post, and then begin to cut back the stem tips to encourage branching after the plant grows up to the top of the trellis. Train the lateral stems by tying them to the trellis. Prune the dragon fruit plant immediately after harvest by removing the weaker, crowded or tangled stems, and then tie the healthy, strongest stems to the trellis. Increase the fertilizer amount gradually during the second and third years to 1/3 or 2/5 lb. of fertilizer applied once every two months, and then increase the amount to ½ to ¾ lb. of fertilizer in the fourth and subsequent years. Apply 6 lbs. of compost or manure once each year, and then increase the amount to 5 lbs. of manure applied twice per year in the fourth and subsequent years. Harvest the ripe, fully mature dragon fruits by cutting the fruit stems using pruning shears or hand clippers. If you have the thorny type of dragon fruit plants, wear leather gloves and a long-sleeved shirt when harvesting the fruits. If you have high-pH (alkaline) soil, drench the soil around the dragon fruit plant with ¼ to ½ oz. of chelated iron during the first year after planting it. In the second and subsequent years, apply up to ¾ to 1 oz. of chelated iron. Perform the soil drench once each year during a warm, rainy period. Don't mow or weed-eat close to the dragon fruit plant, because it's extremely sensitive to any kind of trunk injury. Keep a 5-foot diameter circle around the dragon fruit plant clear of weeds and grasses. Also beware of applying lawn fertilizers near the dragon fruit plant's root system, because this can harm fruit quantity and quality.